I've been a little slow at posting about the "J"'s visit. Too busy I guess. Now that she's gone I have time to catch up. Day 3 was a day for the "J" to visit other Omaha friends. She has so many friends here she should just move here. She'd wanted to experience a good thunderstorm while here and nature obliged with a short but quite thundery-lighteningy storm in the morning before she went visiting. The Wife and I spent the day buying and planting plants for our new garden. It will look great once the coral bells, purple parasols, peonies, two colors of cone flowers, and other perennials we bought get established. Day 4 was filled with an obligatory "J" activity - we went on a roadtrip. This roadtrip took us to the small town of Red Cloud, NE, population 1,000+, childhood home of author Willa Cather. The Wife, before we met, used to take her students on a Saturday field trip to Red Cloud. One of the things she described that peaked my interest was an old Russian schoolhouse northwest of town. The schoolhouse was in some farmer's field reachable by unmaintained dirt roads. I thought it might be a great photographic opportunity. After a three hour drive we arrived at the restored opera house that is now the headquarters of the Willa Cather Foundation. We paid for our guided city tour and we asked about the location of the Russian schoolhouse. To our dismay and my disappointment the schoolhouse had been struck by lightening a few years back and had burned to the ground. Poop. I had to settle for a picture the Wife took back in 1997. The Wife and I have searched online for information about this school and there is absolutely nothing. What a loss for history. The guided town tour took us past historic buildings and we went into the childhood home of Willa Cather, a couple of churches she attended, and the train station. Willa Cather wrote three books about the immigrant struggle on the prairie and all the characters were modeled on Red Cloud residents. We ate lunch at a local cafe that ended with me spilling my drink on myself. The waitress commented that I was not as bad as three unsupervised five year olds eating spaghetti. I was glad to hear that. 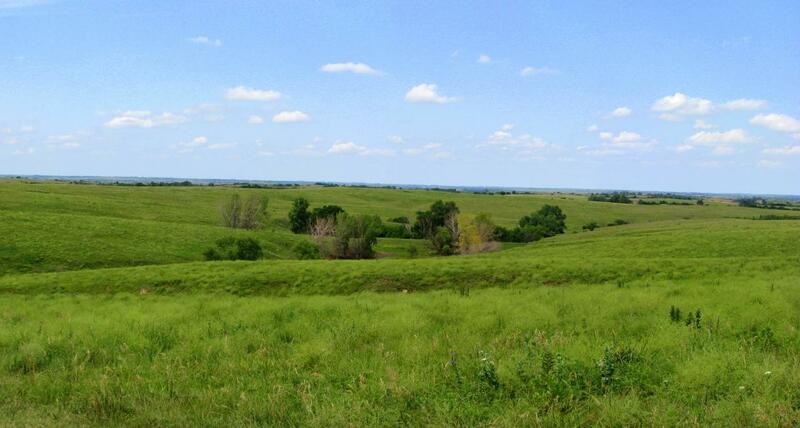 After lunch we drove five miles south to the Willa Cather Memorial Prairie. The prairie is 608 acres of virgin prairie never touched by the plow. The land, purchased by the Willa Cather Foundation and the Nature Conservancy, is being returned to it's pre-1900 conditions before farming and over grazing. Standing out there you could feel what it was like to be a new immigrant, looking out over the land, wondering how you would turn this land into your future. Many didn't. Some pictures of the town and buildings are here. Day 5 will be more history. Can anyone ever have too much history?